Although there are a few notable changes, this year's The Show feels like a rerun. 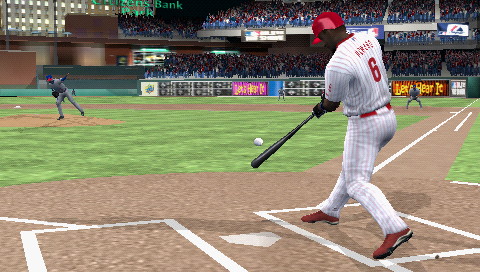 Sony's made enjoyable baseball games for its PSP and MLB 09: The Show is no exception. However, we're a little surprised that the company failed to reach the next level. As it stands, it's an entertaining but all too familiar Show. Many of the modes from previous years return with a few minor changes. Road To the Show lets you take a rookie from the small-town league all the way to the pros, improving his performance in almost every aspect imaginable. There are slightly improved coaching options, as well as a new leadoff system that enables you to work on your base stealing. Franchise Mode also makes a reappearance, in case you feel like driving your team to the Pennant, and you can hop into a quick match against the computer or with a friend through AdHoc/Infrastructure. On the gameplay side, a simple press of a button lets you know how a player's performing either on the mound or in the batter's box. Unfortunately, a few glitches get in the way of your performance, such as mistiming a swing or worse yet, trying to catch a pop fly. That's not to say it's impossible to field a catch, but sloppy collision detection often leads to a bobble. On the technical side, Sony did nice work. The graphics look good, especially the individual attention paid to each field and ball player. There are some mild skips in animation to go with the collision detection issues, but overall it's a solid game. Rex Hudler, Matt Vasgersian and Dave Campbell provide running commentary for MLB 09, doing an outstanding job calling plays and discussing stats. You can also customize your own arena music using songs from your Memory Stick, further adding to the personal experience. Sound effects are equally appealing, from the crack of the bat to the slide into home plate. Along with a decent array of single-player content, MLB 09: The Show also lets you compete with friends through local AdHoc play and Internet-supported Infrastructure. It's a good time once you get hooked up in a match, despite the annoying lag. MLB 09: The Show is a solid portable baseball game, but a few changes would've made it a homerun. There's always next year. What's Hot: A variety of modes, fun gameplay, superb announcing and great visuals. What's Not: Infrastructure and AdHoc sessions suffer from lag, camera issues affect key plays, poor collision detection, feels like MLB 08.